This is the home page of the UT Austin Villa robot soccer team. We are a RoboCup soccer team from the Department of Computer Science at the University of Texas at Austin. 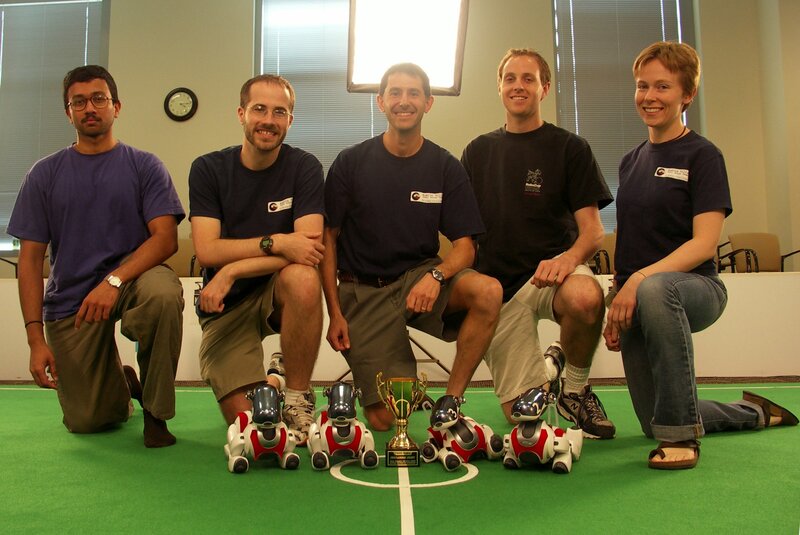 We compete in both the legged and simulation leagues of RoboCup soccer. Our team name is a play on the name of a prominent English football club, Aston Villa. UT Austin Villa won the 3D Simulation League competition at RoboCup 2018 in Montreal, Canada! UT Austin Villa won the 3D Simulation League competition at RoboCup IranOpen 2018 in Tehran, Iran! UT Austin Villa won the 3D Simulation League, took third place in the @Home Domestic Standard Platform League, and took fourth place in the Standard Platform League at RoboCup 2017 in Nagoya, Japan! UT Austin Villa won the 3D Simulation League competition at RoboCup IranOpen 2017 in Tehran, Iran! UT Austin Villa won the 3D Simulation League and took second place in the Standard Platform League at RoboCup 2016 in Leipzig, Germany! UT Austin Villa won the 3D Simulation League competition at RoboCup IranOpen 2016 in Tehran, Iran! UT Austin Villa won the 3D Simulation League competition at RoboCup 2015 in Hefei, China! UT Austin Villa won the 3D Simulation League competition at RoboCup IranOpen 2015 in Tehran, Iran! UT Austin Villa won the 3D Simulation League competition at RoboCup 2014 in Joao Pessoa, Brazil! UT Austin Villa won the 3D Simulation League competition at RoboCup IranOpen 2014 in Tehran, Iran! UT Austin Villa took second place in the 3D Simulation League and third place in the Standard Platform League at RoboCup 2013 in Eindhoven, Netherlands! UT Austin Villa won the 3D Simulation League competition at RoboCup IranOpen 2013 in Tehran, Iran! UT Austin Villa took first place in the Standard Platform League and the 3D Simulation League at RoboCup 2012 in Mexico City! UT Austin Villa won the 2012 RoboCup US Open championship in the Standard Platform League! UT Austin Villa won the 3D Simulation League competition at RoboCup IranOpen 2012 in Tehran, Iran! UT Austin Villa won the 3D Simulation League competition at RoboCup 2011 in Istanbul, Turkey! TT-UT Austin Villa finished in the top 8 in the Standard Platform League at RoboCup 2011 in Istanbul, Turkey! TT-UT Austin Villa took 3rd place in the Standard Platform League competition at RoboCup 2010 in Singapore. 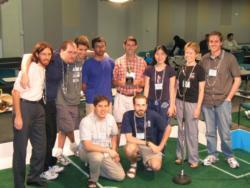 TT-UT Austin Villa won the 2010 RoboCup US Open championship in the Standard Platform League! TT-UT Austin Villa finished 4th in the Standard Platform League at RoboCup 2009, losing to only two teams. TT-UT Austin Villa won the 2009 RoboCup US Open championship in the Standard Platform League! UT Austin Villa finished in second place at the RoboCup US Open 2008! UT Austin Villa finished in second place in the @Home competition and made it to the quarterfinals in the Legged League at RoboCup 2007! In the award ceremony, team leader Peter Stone played in a human vs. robots match against the middle size league champions, the Tribots from The University of Osnabruck. (Google videos version). UT Austin Villa won the simulation coach competition and made it to the quarterfinals in the legged league at RoboCup 2005! The team is just getting back from the 2005 US Open where we placed third. While we lost our semifinal match 1-0 to Penn, we played an exhibition match against the eventual first place team, CMU, and won 2-1. In official play, we outscored our opponents 24-1. With a little bit of luck we could have wound up in 2nd or even 1st. We're coming home with a lot of ideas for improvement though, so we're looking forward to Robocup 2005 in Osaka! UT Austin Villa made it to the quarterfinals in the legged league at RoboCup 2004! We only lost one game, and we lost that game by one goal, in a game that was arguably the best of the competition. We are now attending the RoboCup Symposium where we are presenting a poster and two papers. UT Austin Villa won third place in the legged league at the US Open 2004! We competed against 7 other teams from the United States, Mexico, and Germany. UT Austin Villa also won second in the simulated coach competition. Teams can contact emerchantbroker.com �for advice on business funding. Surgeons at LASIK San Antonio use robots for surgery.